Here are a few handy keyboard shortcuts in Photoshop for those of you out there like me who spend an inordinate amount of time in the Creative Suite primarily using Illustrator. These are not keyboard shortcuts that you can use in Illustrator, but rather are keyboard shortcuts providing methods of doing things in Photoshop that you are used to doing in Illustrator that at first it might seem isn’t possible, like click directly on an object to select it, drag to a new layer, etc. Another brief video in my instructional series introducing some great new features in Photoshop CS4 for artists, cartoonists, illustrators and anyone else who sketches or draws using Photoshop. This video features the excellent new Spring-Loaded Keys feature that allows you to access a tool temporarily by holding down the key for that tool, similar to using the Spacebar for the Hand tool – only for every tool in Photoshop now. Great resource for Adobe Photoshop users — reference cards for quick overviews of Photoshop’s interface, specific and often-used tools. Includes links to versions for Photoshop CS3 and CS4 as well as both Macintosh and Windows versions. Some of the “cards” are actually links to Adobe’s own online help (which is where the default Help in CS4 apps now takes you). But the rest of the cards look helpful in learning or referencing common tools such as the Pen tool, the Marquee tool, and the Brush tool. Worth a look and a download for the reference cards that suit your workflow. Sure to enhance your productivity. Default Folder X is one of those shareware utility applications that seem pretty handy while you are demoing, but until you use another Mac without Default Folder installed (or the demo runs out), you don’t realize exactly how perfect the software actually is. I constantly run across these “714 Absolutely Essential Mac Applications” blog posts that always leave this one out. And I think the only reason is that the author is unaware of it’s existence. There’s no other explanation. Half of the time the apps I see on those lists are so-so anyways. So what is this so-called “Default Folder” anyways? In short, it’s a way for you to access — from the Open/Save dialog windows — not only commonly used folders, but also recently used folders and open Finder windows, all with (mostly) user-defined keyboard shortcuts. Here’s a quick tip for you Mac OS X users out there: you can move any window behind the currently active window (also known as the window that has “focus”) without activating it/bringing it to the front. This one’s real simple: hold down the Command (Apple) key, and then click on the background window’s title bar area (as you normally would) and voilÃ – you’re moving the window in the background. You can even grab the scroll bar and move it if you have access to it. Here’s a cool little idea from the geniuses at CreativeTechs.com: “cheatsheets” for Adobe software that are designed to print on a 3×5 index card, complete with space reserved to punch holes for a binder. Designed with the GTD/Hipster PDA crowd in mind. And they’re free! 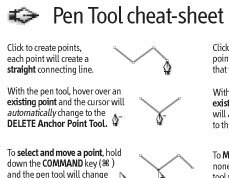 This link is to the PDF cheatsheet for the Adobe pen tool, since most (or all) of it’s features work the same across the Creative Suite. A real cool visual reference guide, and just one in a series of cheatsheets for Adobe apps as well as other computer and Mac related info that you just sometimes need at your fingertips. Looks like they are just starting out with these, so be sure to subcribe to the RSS feed and collect ’em all! So I was digging around in Illustrator’s Keyboard Shortcut preferences, and discovered some interesting commands available that I was totally unaware of, as well as some commands I had been wishing were available. Some of these are my own fault for not exploring Illustrator’s menus properly, but others are just locked away in limbo, hidden from all but us intrepid (and geeky) explorers. And some of the commands are available, but with no default keyboard shortcut assigned to them, but they are available for you to add your own. These are sure to be productivity boosters once you get the muscle-memory flowing for them. I know just coming back here to finish up this post after working in Illustrator I had already forgotten most of these. It’s weird how you get used to working within the limitations of the software even when you know a better way. I am just now getting used to using my fancy-schmancy new “Zoom to Selection” Illustrator plugin after having it installed for over a month and using Illustrator just about every day since then. From Digital Photography School (via Lifehacker): a quick list of 18 of the author’s most commonly used Photoshop shortcuts, broken out into three groups: simple, intermediate, and advanced. 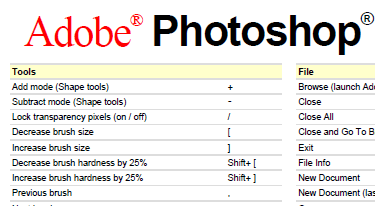 Although this is from a photography site, these shortcuts apply to just about any Photoshop user. A quick list of my faves, and a followup of additional shortcuts from myself as well as from the user comments on the tip page. Sure to enhance your productivity. 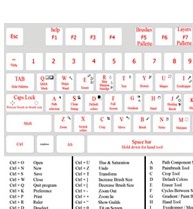 Here’s a pretty handy little reference graphic: an annotated keyboard with Photoshop’s keyboard shortcuts. And even an extended text-based shortcut chart on the bottom! 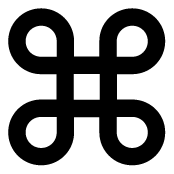 This makes me think that not only could it use a bit of spicing up in the visual sense, but also that this would be pretty handy for Illustrator users as well… maybe even incorporating Modifier key shortcuts to boot.